This article is about water gauges and shows how to use and mount gauge glasses as commonly used in live steam locomotives as water gauges. It is not a construction article on how to make a water gauge, these can be found elsewhere. What are they? Water gauges are glass tubes that allow the level of water in a boiler to be observed, and are usually mounted on the back head and easily readable in the cab. But, other than taking them for granted, there are still a few areas unfamiliar to some modellers. Most vendors either supply a complete gauge glass assembly ready for fitting, or you make your own. But they ALL need a glass tube, and at some time, EVERY glass tube needs to be made or replaced. You can sometimes purhase a tube already cut to your exact required size, but rarely can you find one that is 'just right'. Details on how to cut glass tube for a water gauge can be found here. Sometimes, it can be difficult to see the water level in the glass, or be able to tell if it is completely full, or completely empty (a potentially boiler damaging condition! ), and a visual aid is used to assist in determining the water level. This can be a coloured line (usually blue or red) painted along the glass during manufacture (Schellbach tube), like in a thermometer where the line appears thicker when covered by liquid, or something more elaborate. Here is a little visual example of how to make the water level more visible in the glass, or tell the difference between full and empty. Place a diagonally striped background, 1 to 2 tube diameters behind the glass, and you'll be able to see the water level much more clearly than without this aid! These are actual, un-retouched photos of a 6mm (1/4") dia glass tube half filled with water, shot against a diagonal pattern. The water level shows still more clearly. For installing in the cab, make the pattern just about as wide at the tube, there will not be a distracting background (as here, for demonstration only). Now that you have a gauge glass, and other parts of the assembly, it is now time to put it on the boiler. There are no hard and fast rules, but there are some recommendations. The diagram below shows a typical mounting position. One water gauge is the minimum compulsory requirement, but often, if cab or back head space permits, 2 are installed. The top connection may be via a tube to the boiler if space is limited, it only carries steam with very little flow. 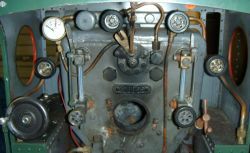 However, it should have its own dedicated boiler fitting and not use a spare outlet on the turret, otherwise a false reading will be obtained due to pressure change when other accessories are used. It is desirable to have a gauge blow down valve at the bottom of the assembly. 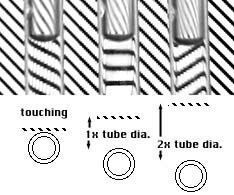 Occasionally bubbles form inside the glass tube preventing an accurate level reading, and can be cleared using this valve. Use a piece of steel rod, the same diameter as the glass, during assembly to adjust the alignment etc of the fittings. When satisfied, remove the dummy metal rod and carefully insert the real glass as the final step. A typical commercially produced model gauge glass assembly. This article contains some material that is Copyright © 2001-2007 by J-E Nystrom. It is used here with permission. 99 Text and photos Copyright © 2006-2019 SMEX, All rights reserved.